Alice Kim, also known by her artist name, Hunjiya, is a junior at the University of Miami in the Musicianship, Artistry, Development and Entrepreneurship program – and she’s as multi-faceted as her major suggests. She writes her own music, records her own albums and creates album artwork for her own projects as well as those of other musicians. 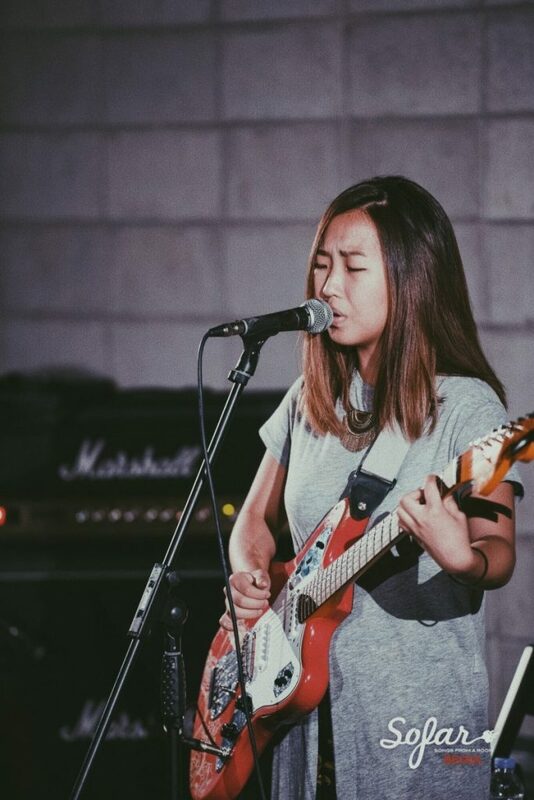 While Kim usually describes her music style as a mixture of indie pop and R&B with some folk thrown in, her recently released EP features a predominantly folk sound. Kim was inspired to create these songs after her trip to South Korea to visit her grandparents last summer. They had never seen Kim perform before, yet have always been extremely supportive of her musical endeavors. “I wanted to make them something special,” Kim said. Her newest four-song project, “Lineage,” certainly is. The songs are written from her grandparents’ perspectives, telling the tale of their meeting and falling in love. Kim did not always love music. When she was young, her mother forced her to play classical piano. Kim recalled that she “just hated it so much,” not yet aware of the creative power she could find in music. Even when she played clarinet in her elementary school’s band, she wasn’t hooked. Her first real interest in music didn’t take shape until eighth grade, when she bought a $20 ukulele from Amazon. “A lot of my introduction to music was me discovering little things and then teaching to myself,” she said. Kim quickly mastered this instrument and performed with it at her eighth grade talent show. She was nervous the entire performance. “Immediately after I performed, I cried,” she said. Despite her persistent stage fright, she stuck with the ukulele, eventually trading it for her brother’s guitar. The guitar served as her gateway to songwriting, and with that, Kim was finally able to use music as a creative outlet. Lianne La Havas had a great impact on Kim’s musical growth, inspiring her to write more original music. Kim was also inspired by K-pop – a genre that combines the music of South Korea with Western pop, rock and electronica sounds – which she listened to while growing up. Now, Kim loves listening to folk and R&B artists, including Bon Iver, Moses Sumney and Emily King, but still has some old pop favorites, such as John Mayer, Maroon 5 and Lorde. “I like how in my songs I’m able to express the emotions and feelings that I can’t really do with words,” Kim said of her songwriting process. She finds that music can serve as a vehicle for exploring perspectives outside of her own experiences. Especially interesting to her is how no two people will feel the same thing when listening to a piece of music. While not writing songs or creating tracks, Kim works on album artwork. She initially created artwork for a friend and fellow UM junior Carter Vail’s album their freshman year. As people in Frost continued to ask her, she continued making artwork. Now, she creates album artwork occasionally but ultimately focuses on her music. Follow Hunjiya (Kim) on her website, Facebook and Instagram for more updates. You can listen to “Lineage,” as well as her other releases, on Spotify and SoundCloud.